Zymotic disease was a 19th-century medical term for acute infectious diseases, especially "chief fevers and contagious diseases (e.g. typhus and typhoid fevers, smallpox, scarlet fever, measles, erysipelas, cholera, whooping-cough, diphtheria, &c.)". In the late 19th century, Antoine Béchamp proposed that tiny organisms he termed microzymas, and not cells, are the fundamental building block of life. Bechamp claimed these microzymas are present in all things—animal, vegetable, and mineral—whether living or dead[when?]. Microzymas are what coalesce to form blood clots and bacteria. Depending upon the condition of the host, microzymas assume various forms. In a diseased body, the microzymas become pathological bacteria and viruses. In a healthy body, microzymas form healthy cells. When a plant or animal dies, the microzymas live on. [clarification needed] His ideas did not gain acceptance. The word zymotic comes from the Greek word ζυμοῦν zumoûn which means "to ferment". It was in British official use from 1839. This term was used extensively in the English Bills of Mortality as a cause of death from 1842. Robert Newstead (1859–1947) used this term in a 1908 publication in the Annals of Tropical Medicine and Parasitology, to describe the contribution of house flies (Musca domestica) towards the spread of infectious diseases. However, by the early 1900s, bacteriology "displaced the old fermentation theory", and so the term became obsolete. 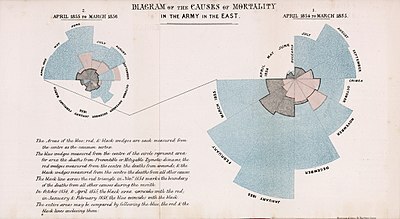 The blue wedges measured from the centre of the circle represent area for area the deaths from Preventible or Mitigable Zymotic diseases ; the red wedges measured from the centre the deaths from wounds, & the black wedges measured from the centre the deaths from all other causes. ^ Kennedy, Evor (1869). Hospitalism and Zymotic Disease (2nd ed.). London: Longmans, Green, and Co.
^ a b c Chisholm, Hugh, ed. (1911). "Zymotic Diseases" . Encyclopædia Britannica (11th ed.). Cambridge University Press. ^ Hess, David J. (1997). Can bacteria cause cancer? : alternative medicine confronts big science. NYU Press. pp. 76–77. ISBN 0-8147-3561-4. ^ Marjorie Cruickshank (1 January 1981). Children and Industry: Child Health and Welfare in the North-west Textile Towns During the Nineteenth Century. Manchester University Press. p. 67. ISBN 978-0-7190-0809-2. Retrieved 23 June 2013. This page was last edited on 31 October 2017, at 00:05 (UTC).